This fun interactive Facebook horse game takes place at your uncle's old rundown farm where you will get your first horse that you design to start you off. You then get to train your horse in disciplines and get other horses to love and train in reining, saddleseat, barrel racing, trotting, etc. You then have goals to meet to get your uncle's farm back to its former glory. Likes: You get to pick what your first horse looks like, and the goals tell you what to need to do to advance. As you advance through the game, you can get more options for breeds and patterns. Dislikes:It is hard to get back on track if you do something that is not a goal. It runs on real time so you have to wait forever and can’t speed it up as far as I can tell. As you play the goals change so you never finish. Tips: Do not do anything unless it is a goal and if you can not perform an action check if something is blocking your path. If you need to move something go to settings and click on the icon with the arrows going in all directions. If you are low on energy, go to friend’s farms and pull weeds. This game is free and since you play it on FB, no download is required. It says in the FAQs that some things are available for purchase (some buildings, for example) but I didn’t run into that when I was playing. The graphics are pretty good. Cute. It says it’s available in English, French and German which is cool since horsecrazy girls are all over the world. But I have to laugh. My horse’s caption said This horse is happy and is having the cravings..”Having the cravings?” It sounds like a disease or something. 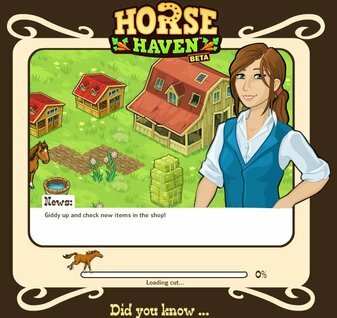 Do you play Horse Haven on Facebook? If you do, please be sure to share your review and tips in the comments below. I play horse haven on my iPhone . I find it is easy for you to advance even if you don't follow goals. In my experience, I just started playing it a couple of weeks ago, if you don't follow the goals after the beginning they stay there so you don't really lose your goals. The horses are a little weird looking, but it's a game so you know. What can you expect? The steeplechasers are a great way to earn easy coins. Overall, this game is fun but I haven't played it on the computer-- is there a computer version?--so I don't know how the computer portion works but it runs smoothly on my phone. Yes I totally agree with that comment. As an experienced Farmville player, I say don’t just do whatever you like if you want to improve the size and quality of your farm. Just stick with the goals. Whatever you do must be oriented towards that. This game is terrible. There used to be a game called Horse Saga. This game replaced Horse Saga which was an awesome game :( I miss that game so much! It was a little slow, but overall fun! this game is good. i can get plenty of tips to yahoo.